These use rollers as the rolling elements and have a high load capacity. The rollers are guided by the ribs of the inner or outer ring. 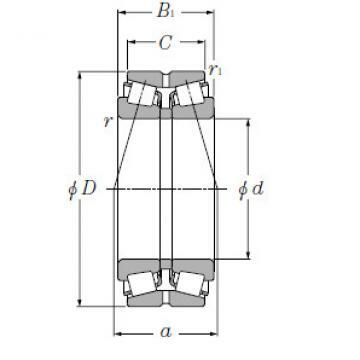 The inner and outer rings can be separated to facilitate assembly, and both can be fitted tightly.On types with no ribs, either the inner or the outer ring can move freely in the axial direction, making cylindrical roller bearings ideal for use in free side bearings that absorb shaft expansion.On types with ribs, the bearing can bear a slight axial load between the roller end surfaces and the ribs. 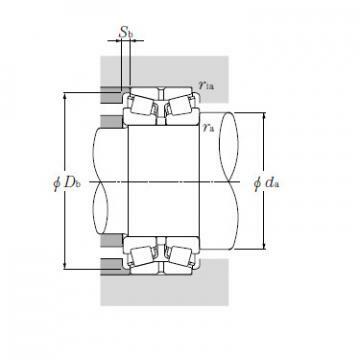 Cylindrical roller bearings include the HT type that modifies the shape of roller end surfaces and ribs to increase axial load capacity, and the E type that has a special internal design to increase radial load capacity. The E type is standard for small-diameter sizes.These are used in the printing cylinders of printing machinery, rolling mill rolls, and the main shafts of machine tools, where thin-walled bearings are required. In the main shafts of machine tools, the radial inner clearance is adjusted by pushing the tapered shaft into the inner ring of the tapered bore.